You are browsing the Blog for Magdalena Abakanowicz' sculpture Vancouver Ancestors Archives - Marja-Leena Rathje. As I mentioned before, last week we ventured out to Queen Elizabeth Park in Vancouver especially to see the Magdalena Abakanowicz’ sculpture installation. I was excited to be seeing her work live for the first time. 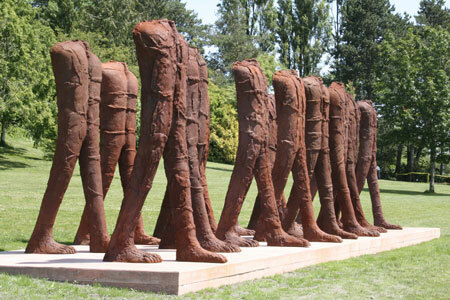 Created for the current Vancouver International Sculpture Biennial, the Vancouver Ancestors consists of 16 three metre tall armless and headless figures, installed on the south side of the park. They look powerful caught in stride with their immense feet, bodies wrapped in folded, twisted and roped cloths of metal. They look ancient because of the rusty surface but they are actually bronze, probably with an iron oxide coating. The backs are concave or hollow I suppose to save on weight. We were quite excited by these figures, looking and photographing them from all angles and curious about the title too. Is it a reference to the ancient peoples of the area? Somewhere I once read that the natives believe that headless figures are spirits from another world (or something like that). I like to think they are spirits of the people who used to live here long ago. 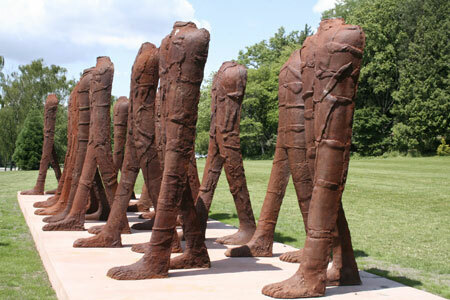 Abakanowicz has worked with headless figures for a long time, so there are other references such as to victims of wars. 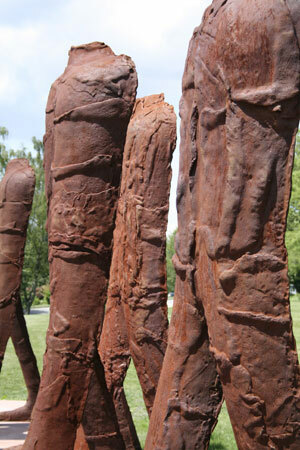 When I first saw Abakanowicz’ work in a book years ago, I fell in love with her fibre sculpure, wrapped figures. Since then she has moved to bronze, which of course is durable for the numerous outdoor installations she has been commissioned to do around the world. I was excited to see that she had captured these textures in the moldmaking process and revealed these on the bronze giants. A note to visitors: I suggest parking on the south side of the park, then walk up the hill. We lucked out in doing this and it was exciting to suddenly spot the installation in the distance. It made for a good approach coming up to it in this way, closer and closer. Since I last posted about Abakanowicz and the Vancouver Sculpture Biennale, the biennale site has been much improved and there are excellent photos of the Vancouver Ancestors and of course, works by the other artists that I still have to go and see.